The PME Politics GE2017 Forecast is officially launched this evening (a bit later than intended). 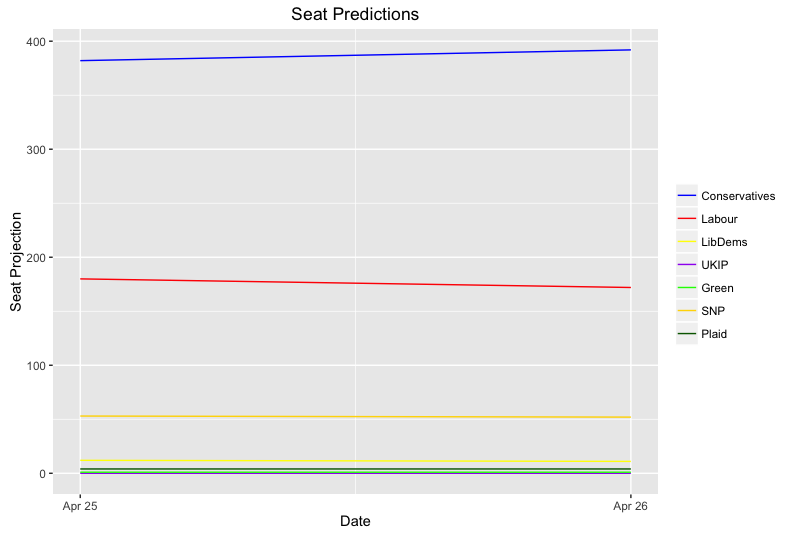 Using a 7-day rolling average of pooled polls (those released by British Polling Council members within the last 7 days), the model estimates an empty 'uniform swing' result before then also applying a range of contextual conditions (as reported on the methodology page) onto the swing in each seat in order to produce a final, 'polls plus' projection. The model has been ran on both data from yesterday and today, so as to give an early sense of its sensitiveness to polling changes. Today's uniform swing model reports the following result: Conservatives 387, Labour 178, Lib Dems 7, UKIP 0, SNP 55, Plaid 4, and Greens 1. This constitutes an increase of 62 seats for the Conservatives, and would give them a majority of 134. Labour would be down 60, and the Lib Dems up 3. UKIP would be down 1, the SNP down 4, Plaid up 1, and the Greens static. Such a result would be a disaster for Labour, and a resounding success for Theresa May. 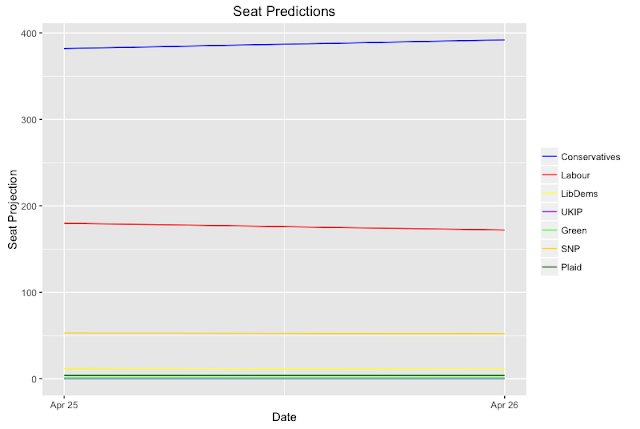 That said, unlike other forecasts this model does not have the Conservatives breaking the 400 seat mark. The same forecast was ran on data yesterday (thus not including the Ipsos Mori and Panelbase polls from today). The result was: Conservatives 382, Labour 180, Lib Dems 12, UKIP 0, SNP 53, Plaid 4, and Greens 1. The graph below shows the change from yesterday to today's predictions. The two polls from today (both with the Tories pushing 50% thus shifted the Conservatives up a few seats at the expense of each of the Lib Dems, the SNP, but mainly from Labour. Updates will follow as soon as new polling data becomes available.